Cryptic tweets are nothing new in console hacking scenes and yet another one has surfaced to make us scratch our heads. 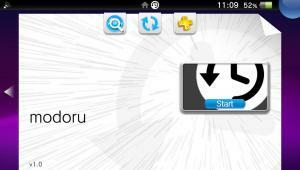 This time, it’s a tweet by TheFlow teasing a homebrew utility called ‘modoru’ and Reddit users were quick to point out that “modoru” means “to return” in Japanese which might be hinting at a utility allowing for firmware downgrading. When presented with a tweet that only contains this image, speculation is rife. However, everything’s pointing to one conclusion which is that “modoru” is a firmware downgrading utility! To further this suspicion, modoru’s LiveArea screen (by Freakler) features a clock with an arrow going back which makes it quite likely that this homebrew is indeed software which lets you downgrade FW 3.67/8 to FW 3.60/5. If this is true, it would be quite useful since a downgrade to these firmwares would allow you to use HENkaku Enso thus granting you a hacked PSVita at boot-time therefore eliminating the need to rehack/rejailbreak your PSVita/PSTV every time you reboot it! Similar to the exploit mentioned above, it is uncertain about when/whether ‘modoru’ will be released or not. That being said, TheFlow has a history of releasing great stuff such as Adrenaline and H-Encore and downgrading a PSVita’s firmware is apparently possible according to Yifan Lu. This is because on Discord, he said that downgrading may be as simple as modifying an encrypted min_vers buffer sent to syscon during a firmware update. homebrew mic is possible ?